Rich brioche monkey bread turned into sinfully delicious bread pudding topped with an ooey-gooey pecan toffee sauce. As good as it sounds! For the coating: Mix together the cinnamon and sugar. Set aside. Combine the yeast and milk in the bowl of standing mixer fitted with a paddle attachment and whisk until the yeast is dissolved. Stir in the sugar and flour, forming a thick batter. Cover with plastic film and let rest in a warm environment for 30-45 minutes. Using the paddle attachment mix on low speed for 2 minutes, or until the eggs are absorbed. Increase the speed to medium and knead the dough for 5 minutes. At this point, the dough will be shiny and satiny. Switch to the dough hook at this point. On medium speed, add the butter, 2 TBSP at a time. Knead until the dough is shiny and smooth, about 5 minutes. Place the dough in a well-oiled bowl and turn it so the top is coated with oil. Cover with plastic film and let rise until doubled in volume, about 2 hours. After the dough has doubled in volume, press down to deflate, folding one half into the other. Fold two or three times. Cover with plastic film and place in the refrigerator for at least 4 hours or overnight. This is the second rise. Remove the dough from the refrigerator. Turn it out onto a lightly floured surface. Divide the dough evenly in half. Cover one piece with plastic film while you shape the other. You will not need the other half of the dough for this recipe so you can either make a loaf of bread or cinnamon rolls with this half. Divide the dough into 24 even balls and place on cookie sheets or baking pans. Cover the dough with plastic film coated with pan spray and let rise at room temperature until it has doubled in size and filled the pans completely. It should take 1½ to 2 hours, depending on the temperature of your room. Toward the end of the proofing, preheat the oven to 350°F. Adjust the rack to the center of the oven. Prepare a standard loaf pan with baking spray or butter. Gently toss the balls of dough, a few at a time, in the cinnamon sugar mixture. Place 12 of them gently into the bottom of the prepared pan, taking care not to squeeze them too close together. Then the remaining 12 on top. Place the pan on the center rack of the preheated oven and bake for approximately 40-50 minutes, until the top crust is nicely browned, and a thermometer inserted in the center reads 210°F. Cool in the pan for 20 minutes, remove from pan and completely cool on wire rack. Note: You want to make the bread a day before so that it can get a little stale for the bread pudding. Spray a standard loaf pan with baking spray. Whisk together the eggs, yolk, cream, sugar, and vanilla until fully combined. Break the monkey bread pieces off into the loaf pan similar to how you made the loaf with 12 pieces on the bottom. Pour half the custard mixture in and press the bread down to soak up the custard base. Break the remaining monkey bread pieces off and place on top of the bottom layer. Add the remaining custard base and again press the bread pieces down. Remove foil and bake another 15-20 minutes. Just making sure none of the custard mixture is still liquid. Remove from oven and let cool while you prepare sauce. Monkey Bread Sauce: Melt butter in a small heavy saucepan over medium heat. Stir in brown sugar, cream, honey, and salt. Bring to a boil, reduce heat to medium, and simmer until glaze is golden brown and glossy, 3–4 minutes. 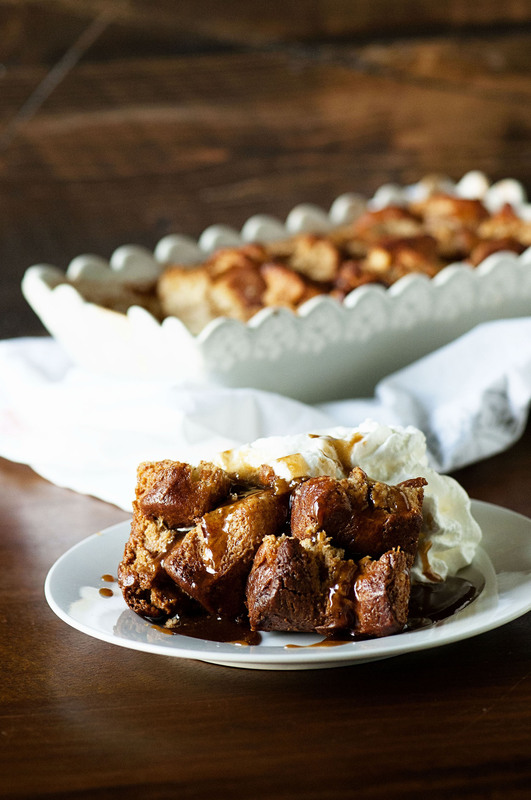 Cut bread pudding into rectangular pieces and top with sauce and whipped cream or ice cream (if desired). See the Brioche Monkey Bread recipe page.